It’s undoubtedly one of the most frustrating, annoying, downright infuriating jobs in constructing a layout. My fingers bleed and I’ve ruined track ends doing it but no more. 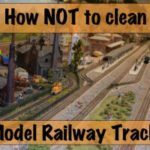 Fitting rail joiners to already laid track is now something I almost look forward to. Well almost! 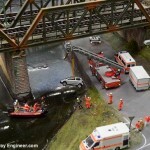 If you’ve ever tried fitting rail joiners to track that’s fixed in place you’ll know the problem. 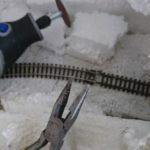 The problem is that once the track is fixed in place there are just millimetres of space under the rails and absolutely no give in which to manoeuvre, slide and manipulate a rail joiner into place. And making this worse, it’s vital the rail joiner be slid into position correctly. 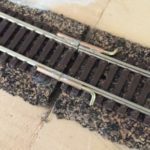 Of course, the best approach is to place joiners to rail ends before fixing the track down but sometimes it’s unavoidable. 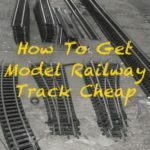 Maybe you want to extend a siding or cut into a line, replace some track or add points (how to alter already laid track) but whatever the reason sometimes there’s just no alternative but to fix joiners to the already laid track. 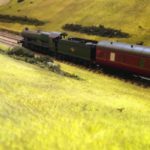 In one recent case, a change of plan required fitting a short section of track to the end of a curve that I’d already glued down. Several broken, bent, railway joiners later I’d just about stopped myself from swearing but decided there had to be an easier way. 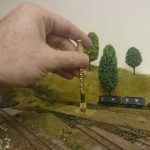 As luck would have it, I happened to have a bit of 4mm metal tube lying around (I use this for carrying wires through Polystyrene scenery). Glancing at this while nursing my sore fingertips I had a Eureka moment. I crimped the end of the tube a few millimetres and pushed the rail joiner in it. (The crimp prevents the joiner disappearing up the tube). With the joiner held snug in the pipe it slid quickly onto the rail and, unlike with my fingertips, could be worked into final position with ease. Once in place, the pipe was pulled back, leaving the rail joiner in situ. Since then, I’ve bent the pipe into an L shape so it can be held above the track and fitted a wooden handle to make it more comfortable to hold. With this tool, fitting rail joiners is now something I don’t dread and I almost look forward to. Find some metal tubing now and make your own version for easier, quicker, rail joiner fitting. 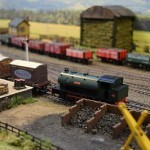 Footnote: The 4mm pipe works for OO gauge rail joiners; other diameters would be used for other sizes of rain joiners. A final, personal, note: I spend a LOT of time testing, photographing, writing and often wrecking my own layouts researching techniques for these articles and don’t charge a penny for them. If you enjoyed this article or it was useful to you in some way, please add a comment to say so, it gives me encouragement to continue. Thanks and happy modelling, Andy. I do like your website. You have lots of useful tips, tricks, info and advice. But mate….you really need to proof read your stuff before publishing it. Just like to say thanks for the advise and tips you publish, and the time that’s involved running this site, it is a big help and I for one appreciate all your work. Thank You, and all the very best for 2019. Thanks for sharing. I will use your idea. Andy, your website is great. And your engineering skills are a big help.